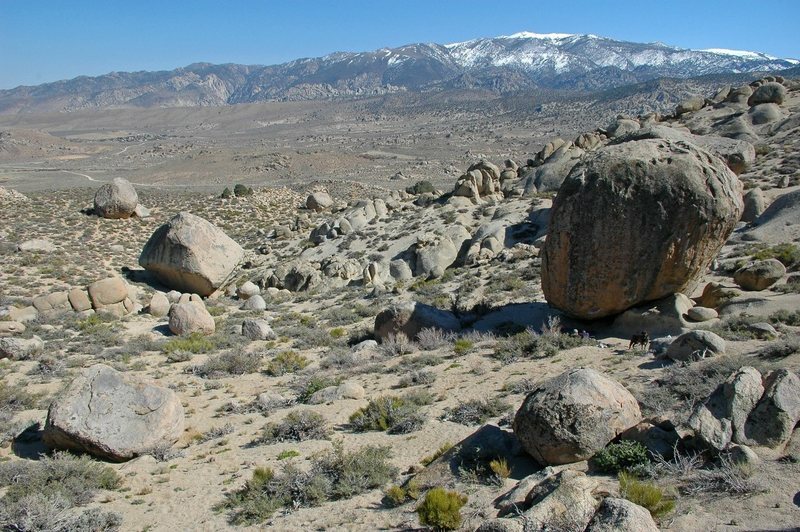 The Pollen Grains are a collection of boulders that lie on the backside of the Buttermilks Main area, to the north. They see less traffic due to the extra 10 minutes that it takes to drive there, but there are some fantastic lines ranging from moderate (Jedi Mind Tricks at V4) to extreme (Spectre at V13). The density of the problems is not as great as Buttermilks Main, but if you want an escape from the crowds and find some fresh problems it is worth exploring. Drive through the main Buttermilk parking lot and continue along the dirt road. Pass over the cattle guard and head North towards the Get Carter Boulder. Once you pass the 'Get Carter' area head right at the fork and travel uphill approximately 1/3 of a mile to the obvious parking area. From the parking area head South uphill along the trail until you reach a ridge/plateau. You should be able to see the gigantic 'Spectre Boulder' ahead and to the right; uphill from that is the 'Beehive Boulder', and the rest of the area including the 'Honey Boulder' and 'Jedi Mind Tricks' is slightly downhill and to the left. Driving time is around 5 minutes from the 'Buttermilks Main' parking lot, and the hike is approximately 10 minutes, depending on where your destination is. Lidija Painkiher. Photo by Blitzo. Lidija Boulder. Photo by Blitzo. That would be Lidija Painkiher. 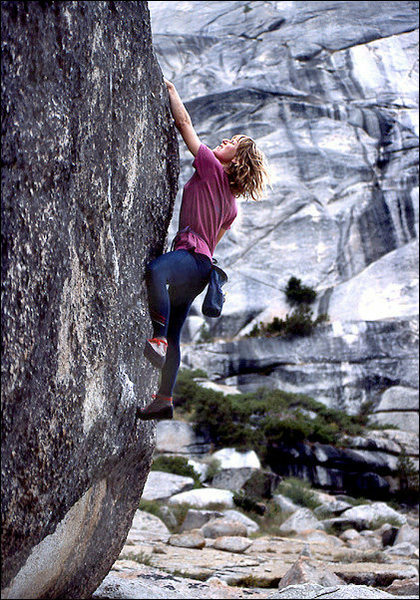 Lidija Painkiher bouldering at Toulumne Meadows. Photo by Blitzo.